If a story is a song, a collection is an album. To take a few examples from my own shelves, Stephen King’s Nightmares and Dreamscapes is like mid period REM, good hard smart rock music (unfortunately his later short form stuff is more like late period REM) Irvine Welsh’s The Acid House a dark funky Screamadelica or Jilted Generation, E Annie Proulx’s Close Range a hard-edged blues chronicle from R L Burnside or the Yossarians or the Blind Boys of Alabama, Lara Williams’s Treats more like some unsigned band blasting the rafters of an under-arches Manchester bar, low-fi and unpolished but with loads of energy and a ragged yet verifiable talent. And as with all great albums – remember when you used to listen to albums all the way through in sequence? – there are disappointments, filler, ego-trips, unsuccessful experiments and longeurs. 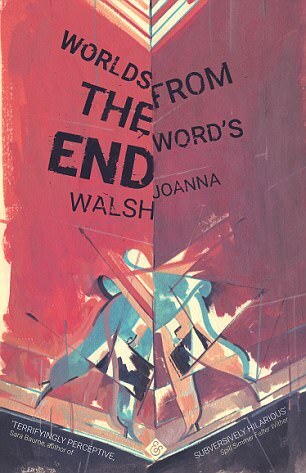 Joanna Walsh’s Worlds from the Word’s End is more like dark, haunted electronica – the Hidden Orchestra’s Night Walks, or the Future Sound of London’s Dead Cities. Walsh was already an accomplished writer, a contributing editor to my old parish 3:AM Magazine, creator of the @Read_Women TL and recently wrote an interesting take on publishing and writing awards. She has the two great skills of short form writers – to write stories with the power and scope of novels, and to write a last line that the reader turns over in their mind over and over again for months afterwards. Her fiction is redolent of transit points in strange cities, and aloneness unaccompanied by loneliness. She opens with ‘Two’ narrated by a person, carrying two well loved objects or organisms to the side of a busy road, waiting for an impulsive stranger, or some rendezvous, for an exchange of – what? We never find out what the Two are, pets or dolls or children, probably better minds than mine would pick it up, but for me the story impressed just as an evocation of what it is like to love someone, or something…. purely for its own sake. It was the title story, though, that really knocked me out – set in a country where communication gradually disappears. That’s a broad and vague way of explaining it, but Walsh writes it brilliantly. The death of words happens slowly at first (‘I’d say our nouns faded first. In everyday speech the grocery store became ‘that place over there”… ‘gatherings – I mean parties, that sort of thing – became quieter, then entirely noiseless’.) Signs disappear, newspapers still publish, but only printing pictures, and eventually just white space; TV still broadcasts, even discussion panel shows, with ‘critics’ reactions… inferred from a facial expressions by a silent studio audience’ and ‘the first wordless president’ wins on ‘a quiet platform, gaze fixed on the distant horizon.’ The only people who still use language are the underclass, and the migrants, who trade words and speech on black markets. It’s an eerie, fabulous creation of a silent world, and I wonder if the later story ‘The Story of Our Nation’ is a companion or sequel? Whatever, for a writer who makes brevity into a song, this collection’s one flaw is that it’s far too brief. Was delighted and surprised to be shortlisted for this year’s Wasafiri New Writing Prize for a recent story. The winner was Ndinda Kioko and you can read her first place story on the website, ‘Some Freedom Dreams’. Update: My own story, ‘Sixteen, Seventeen’ is now available on the site.